Home weight machines can approximate the gym experience. Home gym equipment means no commuting time, and saving money on gym membership. Unlike free weights, exercising with home gym machines usually doesn't require a second person to act as a safety spotter when lifting heavy weights. 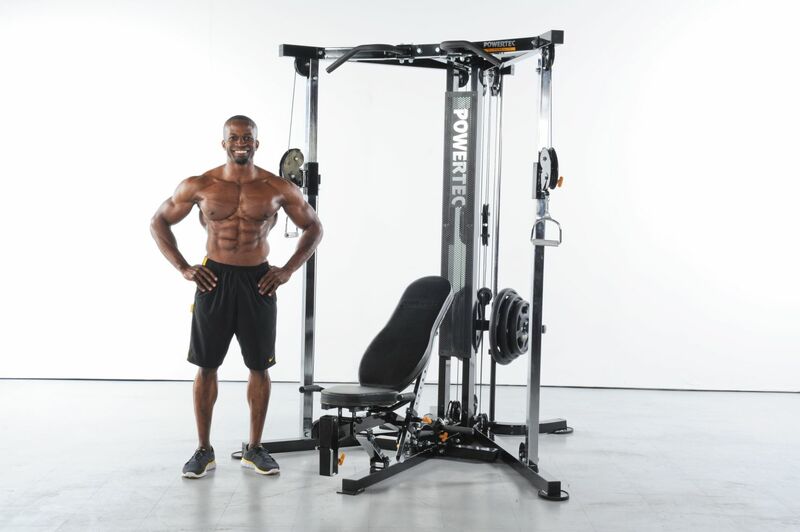 There are a wide range of home weight machine models, even from the same manufacturer. It's a good idea to gain some experience in a gym before choosing one. Prices range from a few hundred to a few thousand dollars. Popular brands include Weider Pro (Crossbow, 8530, 8510), Body-Solid (Powerline, EXM1500s), Marcy, Gold's Gym, Bowflex, BodyCraft, Impex (Powerhouse), Powertec, ParaBody, Schwinn, Stamina (BandFlex), BMI, Tuff Stuff, Vectra, Vigorfit, ICON, Image, Soloflex, Nordic Track, CYBEX, Epic, HealthMax Pro and HOIST. Weight machines take up a lot of space. Finding a machine that will fit in the home is important. Some can be as much as eight feet wide, long and high. Ceiling height needs to be considered, especially for basements. Another one or two feet of space can be needed around the machine to accommodate outstretched limbs or machinery. Folding machines are desirable but many of the larger and more capable machines don't fold, or fold with difficulty. Smaller machines can be folded to as little as a foot thick. Some have custom wall closets for storage. Wheels are useful but the machine still needs to fit through the door. Many weigh a few hundred pounds and are difficult to wheel over carpeted floors, especially if the wheels are small. Larger machines have two or three exercise stations and "stacks" of weights, allowing more than one person to exercise at the same time. A dedicated, permanent space for the gym machine is the best arrangement. Having to pull out a heavy machine each time makes exercising less fun and easier to skip. Storage space for accessories (bars, straps and other add-ons) should also be considered. Most machines use cast iron or cement weights for the resistance mechanism. A notable exception are the Bowflex machines that use spring bars. Bio Force machines use nitrogen gas cylinders. might not give the same resistance throughout the whole range of movement. might give less resistance than the rated equivalent weight (pounds or kilograms). are usually easier to fold and put away. The types of exercises supported is the main difference between models. This is where experience with real gym workouts is useful to decide on the exercises required. Even if the same exercises are supported, there can still be differences. Some machines require awkward body positions or uncomfortable straps. Home gyms are definitely a "try before buy" product. Some models have optional upgrades for lats and leg presses. Free weights are a popular alternative for squats. The gym machine should be large enough for full range of body and limb movement. Anyone over six feet tall should be especially careful that the machine is large enough. Starting weight resistance is 200 pounds for most models, expandable to 300 or 400 pounds. Some entry-level models cannot be expanded. More resistance is especially useful for leg exercises. Some designs are leveraged to double the resistance, causing a 200 pound weight to feel like 400 pounds. Weight machines need to be reconfigured to enable different exercises. Ease and speed of configuration will differ. This is more important for those doing circuit training. Higher-end models have more pulleys and require fewer changes. Changing settings for family members of different heights should also be considered. Most machines are sold disassembled. Assembly can take hours. Some shops offer on-site home assembly services. The warranty should be at least a few years, with companies such as Body-Solid offering lifetime warranties. Charts and instructional DVDs or software are useful but not a dealbreaker. Substitutes can be found on Internet sites such as YouTube. Smith machines for safe use of free weights. Inclined board body-weight machines such as Total Gym. Many have accessories for conversion to a Pilates machine. Owning a standard home gym system is a big commitment. Their cost, size and weight make them a more serious investment compared to an exercise bike. Some gym experience (at least a few months, a year or two is better) on a variety of different machines is the best preparation for choosing the right machine. This way the desired types of exercises and maximum resistance weight can be known.